This is a REBUILT NV3550 Transmission. 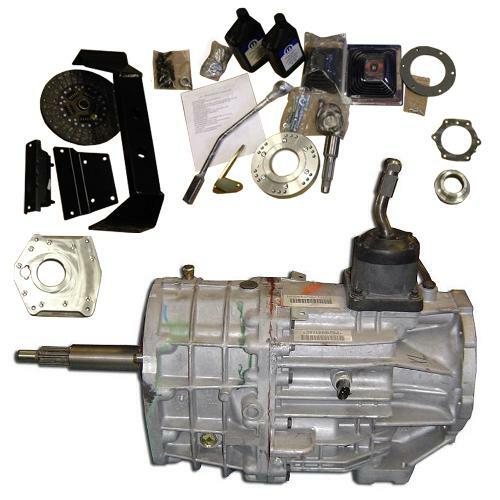 The NV 3550 transmission early Bronco conversion kit comes with all the adapters and hardware to install this 5-speed transmission in your 66-77 Classic Ford Bronco. The overall length and weight of the NV3550 Transmission is very similar to the stock manual or automatic transmissions so no driveline modifications are required when performing this swap. NOTE A minimal body lift or minimal floor pan support modification is required to install this transmission. If you have a factory jstyle shifter for your transfer case, it will require HEAVY modification to make it work. To make things easier, you can install a twin stick j shifter, although it will still requite some modification to work properly. T-Style twin sticks will also require minimal modification. A simple bolt in procedure would require a t-style transfer case, mated with out part no 5000 t-case shifter handle which is available here. Secondary Note: If you are planning on rebuilding your transfer case at the same time as putting in the NV3550, it would be a great time to go to the t-style transfer case due to the ease of installation of the shifter (for those that currently have a j-style t-case). We recommend use of our short throw shifter option on these kits. The standard shift tower is not nearly as tight as we prefer. The short throw shifter handle makes shifting much easier and feels great. You will want to heat and bend the shift handle during installation for a comfortable location. Fits 66-77 Ford Broncos with 289, 302 or 351W V8 Engine and Factory Dana 20 Transfer Case. NOTE: The NV3550 will not work with a PTO winch. I bought this kit having replaced the clutch in my Bronco long ago. I had read an article on Bronco Driver about it and thought I could do it. Thanks to the video instructions, and ready help from the Tom's tech help line,(I spoke to the technician who had made the videos) installation was smooth. It was obvious that the people at Tom's really knew this process. Now my Bronco shifts smooth and easy, and I have overdrive. I would recommend this kit to any home wrencher who wants better performance, smooth shifting, and five speeds.